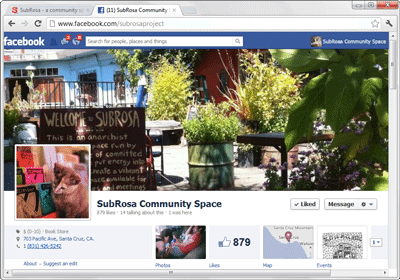 SubRosa - a community space: Hate Facebook? So do we. But sometimes we find ourselves using it in spite of ourselves. Ah, the contradictions and compromises of modern times and global capitalism. Okay, so enough of this interwebs hoohaw. Back to creating awesome shows, events, workshops, classes, open mic, and meetings, and serving up great coffee, subversive literature, and great books.